It was a Merry Christmas for GMAC, which learned on Christmas Eve that the Federal Reserve had approved its application to become a bank holding company. That gives GMAC "access to new sources of funding, including a potential infusion of taxpayer dollars from the Treasury Department and loans from the Fed itself," as the Washington Post explains. Of course, that's on top of the $13 billion that General Motors itself has been granted as a short-term bailout until a bigger bailout can be arranged. GMAC isn't the only company that has suddenly become a "bank holding company" in order to cash in on the $700 billion financial bailout. Late one night in November, American Express was granted the same privilege. Not to mention Morgan Stanley, Goldman Sachs, CIT... Maybe it's time for a new version of Tom Paxton's classic song "I'm Changing My Name to Chrysler," sung here by Arlo Guthrie: "When they hand a million grand out, I'll be standing with my hand out." Of course, there's already been a new version, "I'm Changing My Name to Fannie Mae," sung here by Arlo and here by Paxton. Besides the name of the company, they had to make a few other changes in the lyrics, like "When they hand a trillion grand out, I'll be standing with my hand out." So take it away, Tom and Arlo: I'm Changing My Name to Bank Holding Company. The government's bailout of the banking and automobile industries is likely to expand the federal bureaucracy, creating jobs that could fill vacancies in office buildings, according to the report by the Downtown D.C. Business Improvement District. Members of Congress are getting a pay raise for 2009. With the economy in dire straits, you'd think members would be afraid to be seen voting themselves a raise. And so they were. But the good news -- for Congress -- is that if they don't vote on their pay raise, then they get it. It's automatic! Now one might say that members of Congress run a very large enterprise -- a federal government that spends $3 trillion a year, and getting larger every day -- so it's not unreasonable for them to get at least as much pay as they do. But FedEx Corp. and other companies are cutting the pay of senior managers. Surely members of Congress would not argue that they have managed the finances of the U.S. government better than the managers at FedEx, Motorola, Eastman Chemical, and other companies have handled their firms' challenges. If members of Congress had their pay cut when the budget is not balanced, maybe we'd get more fiscal responsibility in Washington. The Hill newspaper notes that members made $30,000 in 1969, which would be the inflation-adjusted equivalent of $195,000 today. Perhaps members of Congress should not be rewarded for overseeing such a striking erosion in the value of the dollar over just 40 years. The Second Annual International Students For Liberty Conference will be held at George Washington University (Washington, D.C.), from February 20-22, 2009. The conference has already received 100 applications from students in 13 countries, and will be accepting between 150-200 students. Bringing students together to hear about issues affecting liberty and discuss how to promote liberty on campus, this conference is sure to be one of the premiere events of the year for students dedicated to liberty. At the inaugural, 2008 Students for Liberty Conference, three Cato people spoke: myself, Tom Palmer, and Randy Barnett. The speakers list for this year is still being compiled, but the Keynote Speaker will be Yon Goicoechea, recipient of the 2008 Milton Friedman Prize for Advancing Liberty for his work as a Venezuelan law student, leading the student movement for democracy and human rights in his country. More information on the conference and online applications are available here. What's far more worrisome is Blagojevich's bizarre confrontation with the Bank of America. The day before he was arrested on charges of massive corruption, Blagojevich visited a group of striking workers at a North Chicago firm called Republic Windows & Doors. After being laid off the week before, the employees had begun a sit-in, demanding benefits they were still owed by their employer, which said it could not meet their demands because the Bank of America had cut off its financing. At this point, Blagojevich informed bank officials that unless they restored the shuttered window-and-door company's line of credit, the state of Illinois would suspend all further business with Bank of America. A few days later, the bank caved in and ponied up a $1.35 million loan. The idea that the governor of a state as prosperous and important and sophisticated and upscale as Illinois would make this kind of threat is terrifying. Even more terrifying is that Bank of America saw no alternative but to give in. Yet even more terrifying is that nobody outside Chicago seems to have gotten terribly worked up about the situation, riveted as they are on the governor's more theatrical transgressions. But peddling a Senate seat or using scare tactics to shake down a newspaper are nowhere near so serious a menace to society as letting the government arbitrarily intervene in financial transactions between banks and creditors. A crooked governor we can all handle. But a governor who capriciously decides which commercial enterprises a bank must finance and which it can ignore is a scary proposition indeed. Rome wasn't built in a day. But get the wrong politician in office, and you can burn it in a day. What the grandstanding Blagojevich reportedly attempted to do in the Republic Windows vs. Bank of America set-to is precisely the sort of thing that happens in China, where the government routinely orders up bank loans to politically connected firms. Whether a failing company actually deserves financing becomes irrelevant to the conversation; the government doesn't want a company to fail, so it decides that it must not go under, even if it's run by clowns, stooges, gangsters or in-laws. I don't know much about Arne Duncan, President-elect Obama's choice to be Secretary of Education. But I do note this: In seven years running the Chicago public schools, this longtime friend of Obama was apparently not able to produce a single public school that Obama considered good enough for his own children. In the December edition of CatoAudio, I talk about some great moments in the history of liberty and libertarianism, from the ancient Hebrews to the three remarkable women of 1943 and the people fighting for freedom right now against tremendous odds. 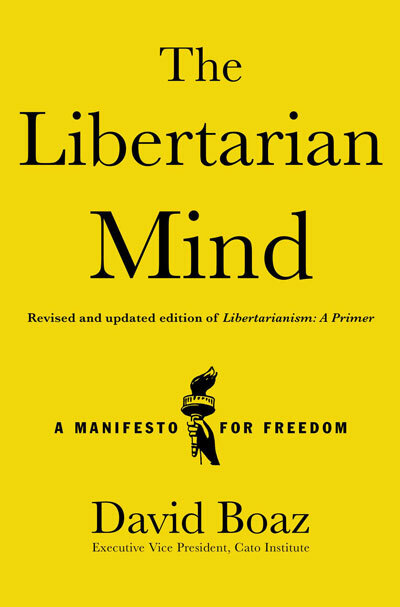 And I reply to the New York Times's criticisms of libertarians who "claim to love freedom [but] have so often had a soft spot for those who would deny it to others." If you're a CatoAudio subscriber, don't be confused by the title "David Boaz on the coming century of liberty," which was actually the title of an earlier speech (video or transcript). This one might better be titled "Great Moments in the History of Liberty" or "A Cause to Be Proud Of." And if you're not a CatoAudio subscriber, then you're missing out! Go here to subscribe. You can either receive a monthly CD in the mail or sign up for an MP3 subscription. Long before federal prosecutors charged Blagojevich with bribery this week, Obama had worked to distance himself from his home-state governor. The two men have not talked for more than a year, colleagues said, save for a requisite handshake at a funeral or public event. Blagojevich rarely campaigned for Obama and never stumped with him. The governor arrived late at the Democratic convention and skipped Obama's victory-night celebration at Chicago's Grant Park. And this paragraph? Shouldn't the phrase "Even though" actually be "Because"? Even though they often occupied the same political space — two young lawyers in Chicago, two power brokers in Springfield, two ambitious men who coveted the presidency — Obama and Blagojevich never warmed to each other, Illinois politicians said. They sometimes used each other to propel their own careers but privately acted like rivals. Surprise! President Bush is willing to spend taxpayers money and inject the federal government into the economy – yet again. The financial bailout might have been justified on the grounds that finance is the lifeblood of the entire economy, and a frozen credit system brings every industry to a halt. But a bailout for a specific manufacturing industry has all the hallmarks of lemon socialism. It puts the federal government in the business of picking winners and losers, reduces the incentive of other industries to avoid excessive risk, creates a lobbying frenzy, and brings the inefficiency of the government sector to the normally more efficient private sector, which under free enterprise must stay in the black or go out of business. But I want to focus on a particularly scary part of this bailout bill. The bill provides that if the government gives companies money, the government will make some of their decisions: limit executive compensation, ban dividends, review large contracts, get rid of their executive jets (certainly a reduction in corporate efficiency, where the time of their top executives is the most valuable resource), make “green” cars rather than the cars consumers want, and so on. But it adds a new twist: The bill currently bars the car companies from pursuing lawsuits against California and other states trying to implement tougher tailpipe emissions standards. Jonathan Cohn of the New Republic suggests taking that concept further and requiring General Motors to fire a vice chairman who has expressed skepticism about the catastrophic effects of global warming. This ought to scare any genuine liberal. Congress is going to use our money to censor political dissent? Usually libertarians warn that if you take government money, you’ll eventually find yourself subject to government restrictions on your freedoms. In this case, there’s no phase-in, no “eventually.” Congress wants to tell private companies, private individuals, that once they take government money, they will shut up and toe the government’s line. If economics isn’t a good enough reason to oppose this bailout, preserving independent thought ought to be.